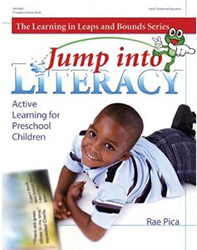 Jump into Literacy combines children's love of active games with over 100 lively literacy activities. Written by a well-known children's movement specialist, these joyful games will engage the whole child in moving and playing as a way to develop the literacy skills needed for reading and writing. Each activity is complete with a literacy objective, a materials list, instructions, and extension activities. Most of the activities include suggestions for related music and children's books. From "The Alphabet in Action" to "Floorwriting" and "Follow That Letter," the activities in Jump into Literacy bring active learning to the classroom!